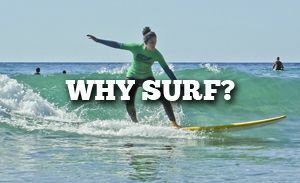 Why should we enjoy the experience of Bio Surf Camp in Suances? 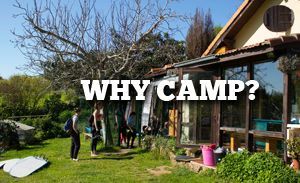 Biosurfcamp is more than a surf school or surf camp in Cantabria: it is a genuine experience based on three fundamental ideas. The first is the Bio philosophy: the respectful contact with nature, the tranquility and rest that comes from our organic garden and surroundings of meadows, forests and caves that maintain the special magic of these corners inhabited since the origins of humanity. Being in direct contact with the environment provides us with health and wellbeing. The connection of people with the natural environment allows them to enjoy small pleasures that we might be unable to appreciate with the accelerated rythme of our daily lives. At Biosurfcamp you’ll enjoy lying in a meadow under the sun, contemplating a sunset from the cliffs, or conversing with other people after having shared an exciting session of waves. The second part is Surf. Surfing is difficult to catalog, between sport of sensations and philosophy of life. An experience with an innate appeal that gets you hooked on your first try. Feeling one with the waves, standing up for the first time and being pushed by the overwhelming force of the sea, living the speed of the water ... Surfing is an activity that has no age, everyone can have fun in the waves and experience the sensation to get on a board for the first time, wether you’re 10 or 60 years old. The third is the Camp. The stay in our surfcamp is something you can only describe as genuine. Glamping type facilities with all the comforts of home translated in a natural environment prepared with utmost care. Inspired by a rich past which housed great prehistoric artists and where the Celtiberian people settled in Castros, we have enabled accommodations that would make our ancestors proud. A nomadic yurt made of materials from the area, as well as modern designs of the bio-construction, such as the dome, perfectly integrated in the environment between palm trees and bamboos. Each corner of biosurfcamp has its history and holds great meaning to us . All these elements constitute the environment that has evolved through time filling our camp with meaning and emotion. People from all over the world arrive, share a surfing adventure, complete open-air breakfasts, laughs, a thousand stories and the good atmosphere of the group begins to invade all the surf camp as another aroma of this world is shared in our lovely camp. Both those who are looking for privacy or the more sociable, all of them, find their place in this surf tribe for a few days, enjoying a “true” travelling experience at Biosurfcamp in Suances. Suances is a unique place for surfing. In just 5 kilometres of coastline we find 3 beaches with magnificent conditions for surfing. And, most importantly, each one responds to different conditions of waves, wind and tides, so in almost any condition, you have a beach that will respond to your level of surfing. The beach is the favourite destination of summer. If you want to add action, sport and a good atmosphere, surfing will give you the perfect combination to get your vacation right. Surfing is a sport in which you work with your entire body. Also, as you perform several guided sessions, your evolution shoots up. Surfing is a matter of balance and we apply it to the whole project. We do a series of indoor surfing exercises, theoretical classes and we have a lot of complementary material for those who want to get deeper into the world of surfing. We are a unique combination of nature, beach and fun, where you can enjoy your free time intensely while immersing yourself in the world of surfing. 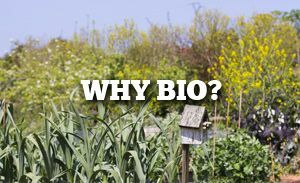 Why take your vacation to a Bio place? For balance, rest and health. We provide an accommodation, and special environment where activities are integrated in the nature surrounding us, eliminating or reducing to the maximum the ecological footprint of our activity. It is known that, we rest better in nature. Surrounded by trees, meadows and gardens, you’ll be able to recover your strengths and enjoy a very comfortable rest. Life in the city is normally subject to stress, noise and pollution. We need a parenthesis to recover, so Biosurfcamp also helps improve your health. A full breakfast with homemade products, a sauna and sports at sea can be the key to a healthy vacation. Why spend the summer in a surf camp? Stays in conventional vacation destinations can be very impersonal. In Biosurfcamp you will be immersed in a friendly and warm surfer atmosphere, where friendship arises spontaneously after sharing breakfast, waves and strong emotions. You will share the experience with many other surfers who come to enjoy a different kind of vacation. If what you need is a quiet retreat, then you will find in Biosurfcamp a haven of peace to disconnect. You will be surrounded by nature on all sides: animals, plants and fruit trees of all kinds that form a very unique environment. 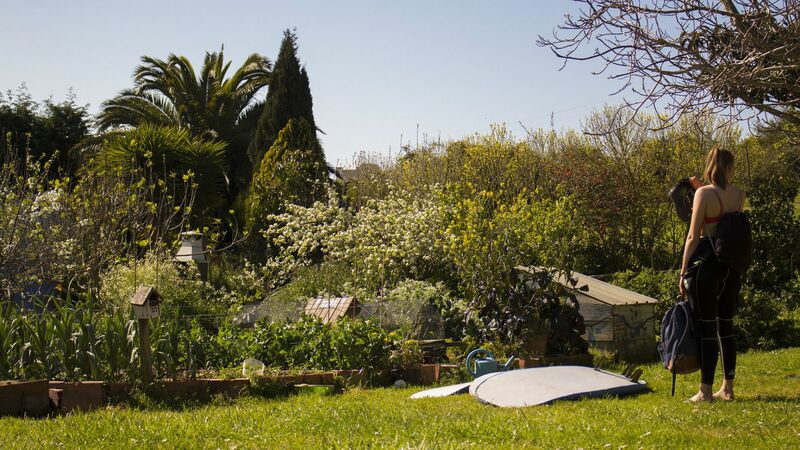 We provide a lot of extras to the accommodation, such as sauna, barbecue, bikes, skates, longskates, slacklines, surf books, surfskates and self-guided routes so that your stay with us is much more than a place to sleep. In addition, we give classes of stretching and relaxation, functional training on land, theory of the world of surfing and outdoor cinema to complement your experience.